Clarity Dentistry’s mission is to provide lecture-free, superior quality dental healthcare to all in the Indianapolis area. We treat patients with total transparency, honesty, and compassion to create long term, trusting relationships. By providing exceptional, comprehensive dental care, we hope to be the clear choice for all of your family’s dental care needs. Welcome to Clarity Dentistry, where healthy and attractive smiles are created and maintained! We proudly offer world-class dental care to you and your family, as you have entrusted us with one of your most cherished assets – your smile. Whether you are just looking for a dentist in Indianapolis in case of emergency, or your regular family dentist you see every six months, Clarity Dentistry is here for you in Indianapolis, IN. We offer emergency dental services which will get you out of pain and discomfort as well as general and cosmetic services to keep your oral health and smile in optimal condition for the rest of your life. As a premier dentist in Indianapolis, Clarity Dentistry realizes that access and affordability is critically important to best serve our patients. For that reason, we proudly are in-network with a vast number of dental insurance companies and offer flexible monthly payment plans to ensure you can get the quality dental care you deserve. We also hope that our staff’s warm welcome and our office’s calm, relaxed atmosphere will take some of the stresses out of seeing dentists in Indianapolis. It’s no secret that many people have dental fear and anxiety, typically from a traumatic past experience. Please realize that we are different, and will do everything in our ability to ensure you are at peace and comfort during your visits. 100% Fee Transparency at our Clarity Dentistry Office! Our emergency dentists on staff are able to handle most dental emergencies, getting you out of pain and discomfort, and allowing you to get on with your day. We promise to treat every patient with honesty and integrity. Through trust, we build life-long relationships with our patients. We believe that in order to earn your respect, we first must give you respect. We are extremely humbled by your decision to choose Clarity Dentistry. We understand the severe anxiety that most people feel when visiting the dentist. We promise to do everything possible to ensure you have a peaceful and carefree visit. Clarity Dentistry’s dentists are all trained to the highest degree of clinical standards. Rest assured that your family is in fantastic hands with our experienced dental professionals. 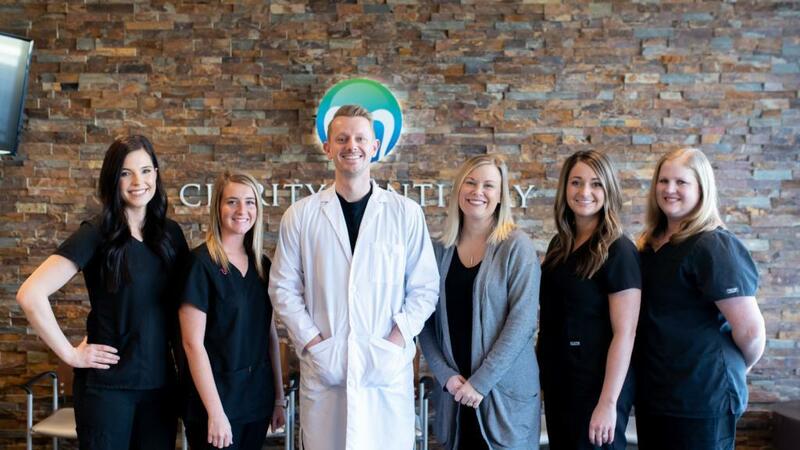 As a highly rated Indianapolis dentist, Clarity Dentistry provides most general dental services, specialize in the prevention, diagnosis, and treatment of most conditions pertaining to the the mouth and teeth. We clinically diagnose tooth decay, gum and periodontal issues, infections, jaw pain, sleep disorders, among other potential issues in your mouth. Preventative Services such as dental examinations, diagnostic digital x-rays, dental hygiene, patient education, fluoride treatments, sealants, night guards to prevent grinding, home care instructions, etc. Restorative Services such as tooth colored fillings, dental crowns and bridges, replacement of missing teeth using appliances such as partials and dentures, gum and periodontal procedures, root canal treatment, orthodontics, etc. Other Oral Health Services such as treating sleep apnea. Seeing an dentist in Indianapolis every 3 – 6 months as recommended by the American Dental Association can benefit your oral health tremendously. By being proactive about seeing a dentist in Indianapolis regularly, which allows for the diagnosis of possible issues before they become serious, you can save time and money as well as help keep yourself out of pain. Digital X-Rays – By using digital x-rays, we are able to get a better look at the anatomy of the teeth when compared to traditional, film based x-rays. For one, the images are much larger, and we can zoom in giving us a better view. Second, the dentist and the patient can co-diagnose much easier and efficiently having the x-rays displayed on a digital monitor. And third, digital x-rays emit far less radiation than traditional films. Intraoral Camera – Our Intraoral cameras are helpful in taking top quality photos of the teeth surfaces. This allows us to view these images on the large screens located in each room, and patients can see the existing problems in that particular tooth firsthand. By examining the tooth’s enlarged image, we can easily detect cracks and recognize other areas that have been decayed or damaged in a tooth. You should call Clarity Dentistry immediately if you experience any type of pain, discomfort, or injury to your teeth so that we can successfully repair or remove any damaged teeth. We, as a top Indianapolis dentist can help with all kinds of dental emergencies including a toothache, a swollen face, trauma, abscesses, both lost and broken crowns, chipped teeth and lost fillings. We understand that many people just want to see a dentist in Indianapolis when an issue arises, and that’s okay. We also realize that some other offices lecture these patients, making them feel embarrassed or uncomfortable. Not us! We are a lecture-free practice, and respect our patient’s decisions with regards to their dental care. If you have a dental emergency please call 317-300-0205 immediately so our dentist can help you. At Clarity Dentistry, we want to ensure that you feel great about your smile and show it off daily! Having an attractive smile can be beneficial in many ways. It can give a person higher self-esteem, and it can help make a great first impression for networking, when dating, on job interviews, etc. It is also widely known that whiter, nicer teeth can make a person look younger. I’m sure we all know someone who either doesn’t like to smile, or covers their mouth when they smile. We are able to restore his or her confidence by giving the patient the smile of his or her dreams. To achieve a stunning smile, our dentists perform a variety of cosmetic dental services, such as teeth whitening, dental veneers, all porcelain tooth-colored crowns, dental bonding and so much more. So, if you’re wanting a fresher, brighter smile, please call Clarity Dentistry at 317-300-0205 to schedule a cosmetic consultation! Severely decayed or broken teeth may have to be removed to prevent the spread of infection as well as relieve a patient of excruciating pain. In many cases, wisdom teeth may need to be extracted when they are crowding and pushing the adjacent teeth, which typically causes great discomfort in the jaw. There are two types of extractions, simple extractions and surgical extractions, and they mean just how they sound. Simple extractions only require the dentist to pull the tooth out with forceps, whereas surgical extractions require a tooth to be removed using a surgical incision. In some cases, just the root tip of the tooth is remaining in the gums, which also needs to be removed to inhibit dental problems. You are advised never to extract your own tooth by yourself at home, as this is likely to lead to a more serious problem. Our Indianapolis dentists have the expertise, the appropriate equipment, and a hygienic environment in which to conduct this kind of procedure both for the best outcome and a speedy recovery. Partial dentures and full dentures are created to replace one or more missing teeth in your mouth. They are tailor made to fit your mouth so they resemble your natural teeth. The benefit of having dentures is to maintain proper eating and chewing function, and to prevent teeth from drifting out of place. There are several patients who unfortunately lose some or all of their teeth due to various reasons. Genetics, rampant decay, and periodontal disease can all play a role. We go an extra mile to make amazing complete and partial dentures for our patients, that not only look very realistic and natural, but also fit well. Some patients are candidates for implant supported dentures, which use state-of-the-art implant technology to greatly secure and stabilize the dentures in the mouth. This amazing technology can assist people who have had bad experiences with ill-fitting dentures that constantly slip out.